It has been a long time since my last post, I’m must admit I was both busy and trying to find something cool to blog about. Because I’ll be in holidays tomorrow, I decided to take some time to build a sample application that demonstrates a feature of WPF I’m going to use soon. In the sample application (source code available here), you will be able to play with the BezierSegment class. 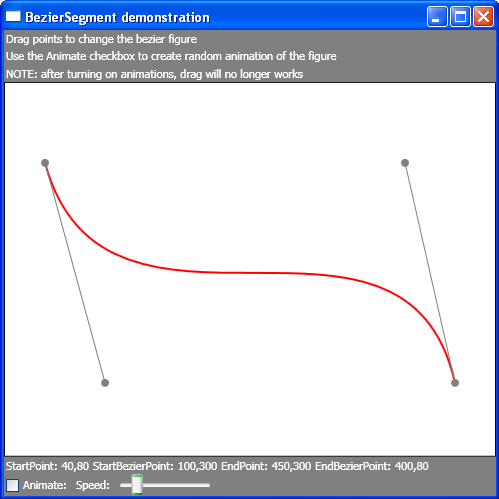 I created a simple control that wrap the BezierSegment into something more easy to visualize.The application allows you to drag and drop points and to animate the line. In my previous post, I started to write about things that I think makes WPF different. In the current project I’m working on at work, I had a good example of a new way of thinking with WPF. Todays article deals with a new WPF concept called Attached properties.